When the term “Bushveld” is heard, it invokes memories of the Waterberg, Kruger National Park and too many other remarkable areas to name here. It normally refers to vegetation consisting of sparse trees with an open canopy and some undergrowth that includes perennials, bulbs, succulents and grasses. In most areas, frost is absent or very light. Rainfall is moderate. Soils are not very rich in organics and is quite often sandy, although not always. Now that we have defined our setting, we can begin to populate it with appropriate plants. That is, plants that have moderate water requirements, prefer a sandy soil not containing too many organics and are not comfortable at -5°C. Not all plants can be discussed and some will only be named. Refer to our Indigenous Plant Database or www.plantzafrica.com for more detail. 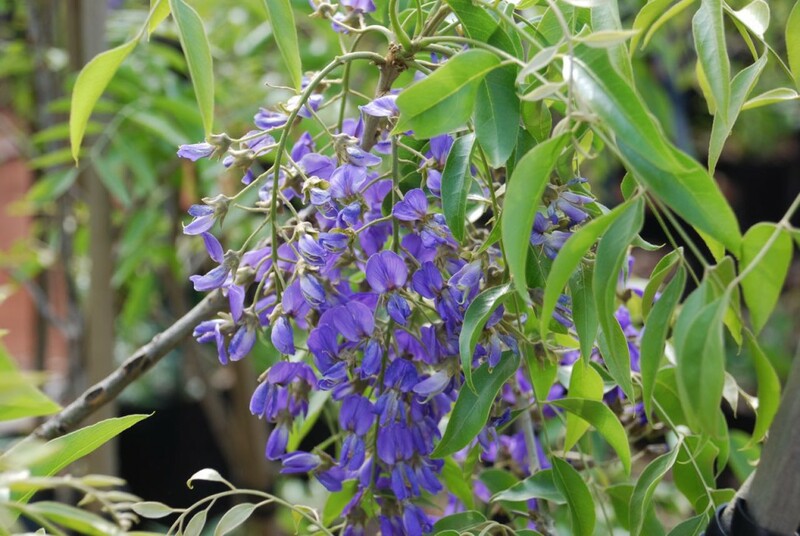 Certainly, one of the most rewarding trees to grow is the tree wisteria, Bolusanthus speciosus. The canopy is not very dense and it can handle quite a range of soil types. Masses of blue flowers are borne in Spring. A tree that is also underrated is the wild pear, Dombeya rotundifolia. It is the first tree to flower in Spring, producing masses of white flowers. 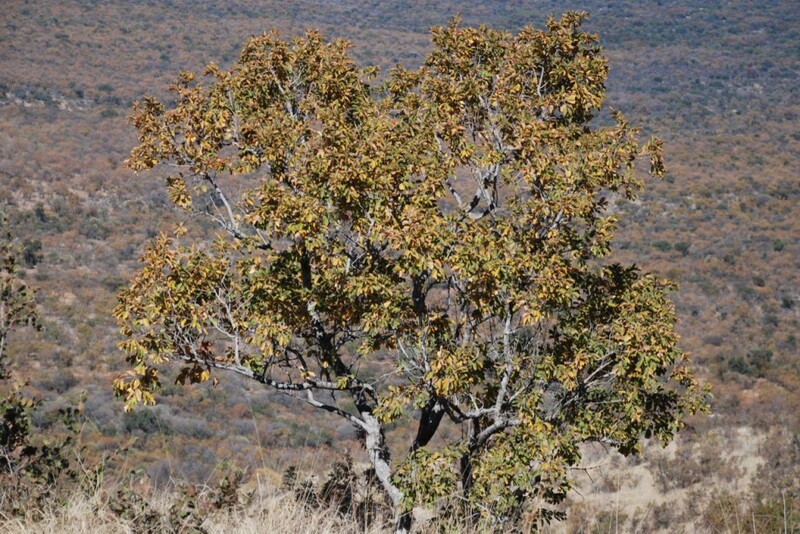 Other trees to consider: Combretum nelsonii, Schotia brachypetalla, Vepris lanceolata, Erythrina lysistemon, Combretum apiculatum, Heteropyxis natalensis. 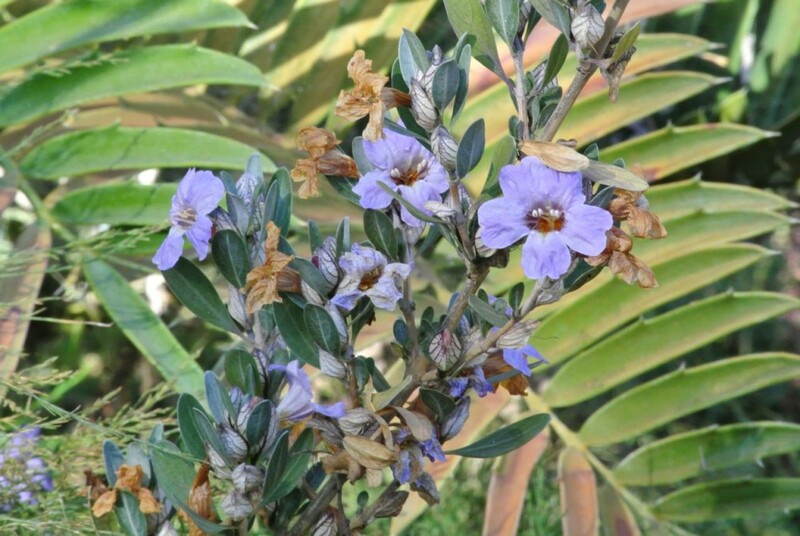 The region also hosts some beautiful and unusual shrubs that are an asset to any garden. One of the first ones that come to mind is Ochna pretoriensis. Like all Ochnas, it has beautiful flowers and seeds but its relative small size means that it can be planted in the understory. A smaller one, Petalidium oblongifolium, also grows either in sun or in the under story and produces copious amounts of blue flowers. A must for a sunny spot is Clematopsis scabiosifolia (Clematis). It sprouts annually from a woody root stock. Both the flowers and the seed heads are worth the effort. Other shrubs to consider are: Grewia flavescens, Croton pseudopulchellus, Carissa bispinosa and Leonotus leonorus. Now we come to the bulk of the under-story that consists of perennials, bulbs and grasses. It is important to include all three if you really want to watch the go by from your stoep or hiding place in the garden. Triumfetta sonderii does not have very exquisite flowers but the seedpods are what it is all about. Red fluffy balls that remain on the plant for months. Another interesting one is Becium obovatum, the cat’s whiskers. I think the common name says it all. Few plants can beat the Barberton daisy, Gerbera jamesonii. Just make sure that you buy the specie. Many of the hybrids are chemically manipulated to produce monstrous flowers, but they are not worth much as garden plants. Other to consider: Sycolestemon pretoriae, Chlorophytum krookianum and Asparagus plumosus, a climber. The Bushveld is blessed with some extraordinary bulbs. Remember that they require full sun unless otherwise stated. 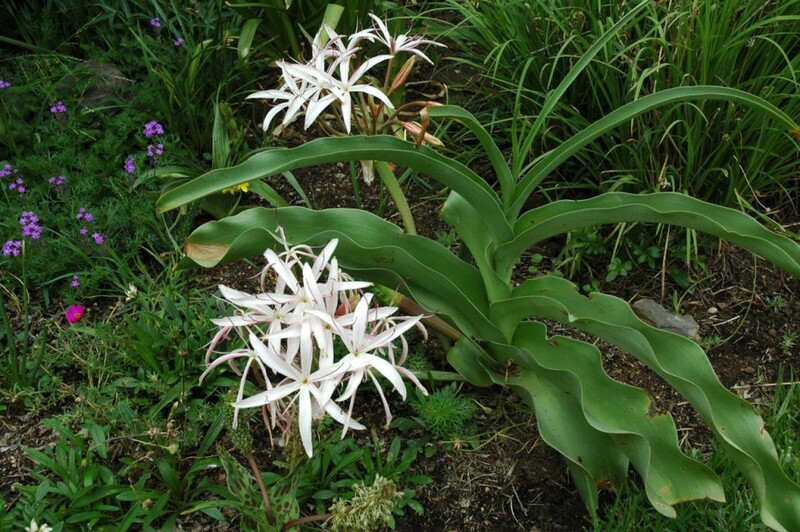 Crinum boophanoides has fan-shaped leaves reminiscent of the Boophane and flowers resembling a monstrous spider. 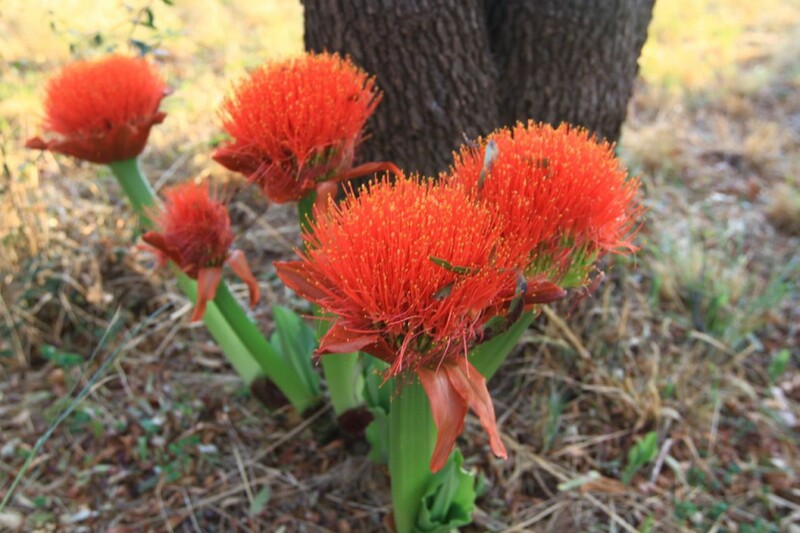 Scadoxus puniceus should be the official emblem of the Bushveld. Plant it in semi-shade and treat it as a succulent. A mass display is a must. One that is also extraordinary, is Ammocharis coranica. Leaves are flat on the ground and the flower is a huge umbel that eventually turns into a tumbleweed. The following can also be considered: Ledebouria floribunda, Freesia grandiflora and Ornithogalum saundersii. The grasses should be considered as the canvass. Choose them so that they compliment or enhance the other plants. Taller grasses can be interplanted with taller perennials. 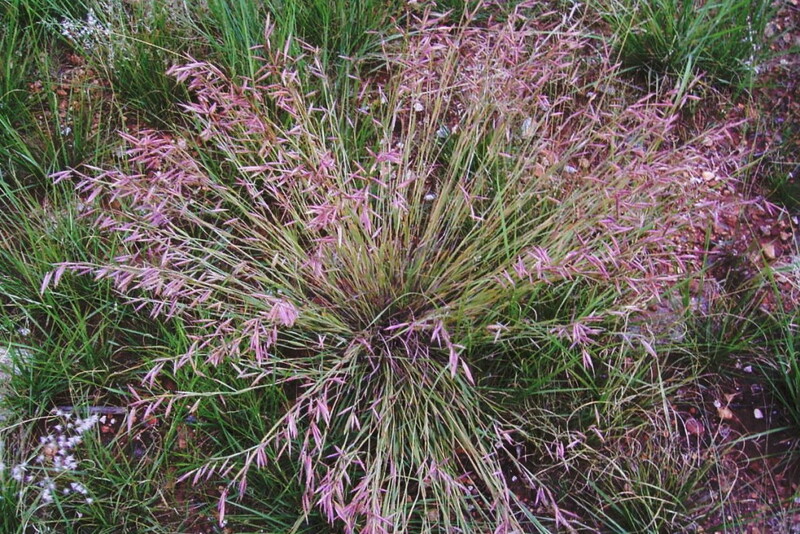 For example, use Aristida junciformis as the canvass, but interplant with Albuca nelsonii, Watsonia angusta, Dierama mossii etc. Other tall grasses that can be used are Eragrostis chloromelas, Monocymbium ceresiiforme and Sporobolus festivus. Setaria megaphylla is more suited to a shady spot,although it will also thrive in sunlight, but will become much bigger. The smaller grasses such as Harpochloa falx and Sporobolus stapfianus can be used as the canvass for a more delicate part of the garden. Inter plant with Gnidia caffra, Pentanisia angustifolium, Indigofera hedyantha and Schizocarpus nervosus. The combinations and perturbations are endless. In the end it boils down to imagination and availability. Please send me pictures of your garden once completed.